Even after losing Trincomalee to the grip of the US Pacific Command, which recently renamed itself as the United States Indo-Pacific Command, the New Delhi Establishment has no qualms of increasing Chinese presence in Jaffna. Informed media circles that interacted with Colombo-based diplomats of New Delhi as well as with Indian journalists well-connected to the Indian National Security Advisor, said there were no reservations about Chinese corporates accessing Poonakari nor about the ‘archaeology’ of Chinese at Allaip-piddi, a locality in the island of Oo'raaththu'rai (Kayts). “China accessing Poonakari for fishing and Kayts for isolated heritage purpose is not a security threat. We are already in control of the highest view of the area, and New Delhi is not worried of Chinese digging the coast of Kayts,” a diplomat said without specifying the “highest” lying locality of Indian control. 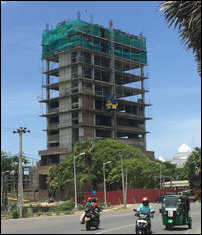 The current state of Jaffna Cultural Centre being constructed beside the Jaffna Public Library. Photographed this week. The “highest view” that the Indian diplomat was talking about was none other than the “Jaffa Cultural Centre,” which is being constructed with Indian assistance just 6.5 km (as the crow flies) close to the Allaip-piddi coast, informed Tamil sources in Jaffna told TamilNet. Indian Prime Minister Narendra Modi unveiled the plaque for the JCC on March 14, 2015. Indian National Security Advisor Ajit Doval was also present at the event. The building is expected to be fully completed by 2019. In the meantime, there have been unconfirmed reports of Indian authorities securing the top floor of the building for their ‘national security’ purposes. 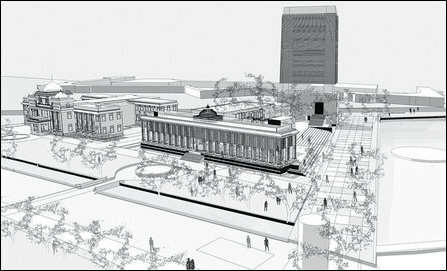 Architectural sketch of Jaffna Cultural Centre (JCC). The JCC comes under SL Prime Minister Ranil Wickramasinghe (UNP), who is also the minister of National Policies and Economic Affairs. The JCC was initiated during the times of SL Minister of Economic Development Basil Rajapaksa. At the same time, the Central Cultural Fund (CCF) currently engaged in archaeology projects in the North-East also comes under the domain of SL Ministry of Higher Education and Highways. Both the ministries are under the control of the UNP. India is also involved in highway-based mega industry ‘development’ projects aiming to link Trincomalee through Mannaar. NPC has no say in the projects controlled by the unitary state of genocidal Sri Lanka. During the unveiling event in 2015, NPC Chief Minister Justice C.V. Wigneswaran, who spoke before Indian PM Narendra Modi pointed out the inadequacies of the 13th Amendment-based outlook. He reiterated the need for political settlement preceding the development plans in the North-East to Indian Prime Minister who was present there. However, Mr Modi, in his speech was only talking about cultural connections and development. There was no mention of Indo-Lanka accord, 13th Amendment nor a political solution. A Colombo-based Indian journalist well-connected with the Indian National Security Advisor in India described Eezham Tamil thinkers as belonging to “old-school”. “The Tamil intellectuals in Jaffna, Tamil Nadu as well as those in the Tamil diaspora, still think of harbours and military-centric access as being the main factors of geopolitics,” the Indian journalist observed. “The modern-day naval fleets of the strategic partners [USA and India], sophistication in surveillance and the latest technology have outgrown the need for physical access to harbours and strategic points of access,” the Indian journalist opined. The Indian diplomatic and media circles were of the opinion that it was plugging the agent State in Colombo in the grid of strategic partnership (bandwagonism) and cultural connections with the people on the ground. The ‘connection’ to the people in the North-East is achieved through the so-called paradigm of ‘culture’ and ‘development’. The Establishments want therefore the people to get locked into the same grid of geopolitics into which the agent State and the strategic partners are plugged in. The ‘connection’ with people is aimed at keeping the people under containment. The SL military occupying the North-East is also seen as a factor facilitating this State-centric process. The USA and India are ‘modernising’ the SL military, the sources claimed. In the meantime, Tamil students engaged in excavations said the reports of Chinese excavations in Kayts were leaked to Tamil media to divert attention away from SL military's drive to seize Jaffna Fort. The students further said their excavations and findings on traces of Tamil Buddhism are systematically used by the UNP to convert the places into Sinhala-Theravada Buddhist temples and stupa. 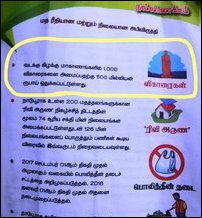 The UNP has openly claimed to erect 1,000 Buddhist stupas in the North-East. Poonakari is situated in a controlling location linking Vanni with Jaffna Peninsula, with Palk Bay and Jaffna Lagoon on either side. It is also located close to Raameasvaram and Tho'ndi of the Tamil Nadu coast. 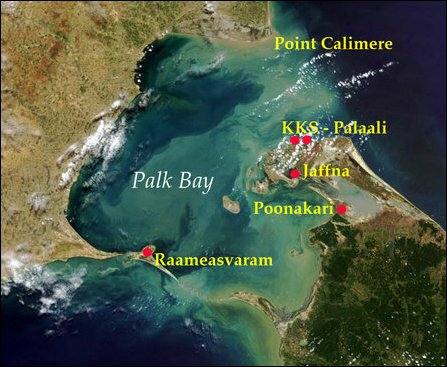 The Kayts island, which is guarding the entrances into the Jaffna Lagoon, was the hub of maritime contacts since very early times, due to its location facing the Palk Strait. 11.08.18 New Delhis' suppression of Tamil Nadu equally detrimental as..
10.08.18 Tamil Nadu police detaining leader of May 17 Movement condem..
08.10.17 SL constitutional discourse seen coupled with ‘Vision 2025’ ..
14.03.15 Wigneswaran seeks extra-constitutional approach to resolve T..
05.02.12 China to build airport in Poonakari to balance India’s Palaa..
11.09.18 Powers appeasing SL State risk future instability ..
16.08.18 New Delhi with ‘cultural presence’ not concerned a..
12.08.18 Militarisation of Jaffna Fort dashes hope of estab..
06.08.18 Colombo wants to seize lands of Muslims near Manna..
05.08.18 NPC Minister responds to SLA Commander, British Ar..
02.08.18 Jaffna Fort belongs to SL military, proclaims Comm..
29.07.18 Coningham discovers Jaffna as premillennial mariti..
21.07.18 British archaeologists, Indian contractors abet Co..
08.07.18 TNPF protests against Colombo's move to militarise..
06.07.18 Jaffna University silent to Colombo's pressure, mo..
31.05.18 Genocidal Sri Lanka wants to militarise Dutch Fort..